The premier event our Diocese has for vocations is the iRace4Vocations 5K Walk/Run, which took place this year at Williamstown High School. It was a great experience to be surrounded by the people of the Diocese and to see all the support offered towards seminarians. It also continued the awareness of the constant need for prayers for more vocations for our diocese. One of the more challenging parts of being a seminarian and taking classes that involve rigorous work is finding the time for prayer. Often, there is a tendency to put prayer on the back burner, but, in order to sustain a call to the seminary and continue discernment, one must be willing to find the time for silence and deep reflection. Often, the rosary is the best way to achieve this. Sitting down for 20 minutes and meditating on the mysteries can easy anxiety and fulfill the longing for deep, intimate prayer with God, through the Blessed Virgin Mary. The rosary calls on us to reflect on the ups and downs of scripture, at times through the eyes of Mary and calls us to place ourselves inside those mysteries as we reflect on them. This is just one of the countless tools that can be used to further discernment and to help support an increase in vocations to the priesthood of Jesus Christ. Prayer can be the linchpin of our lives and lead us to follow Christ closely and can lay the seeds of a vocation to the diocesan priesthood. Taking part in iRace4Vocations and seeing all the supporters of seminarians, and those discerning, is incredibly encouraging. 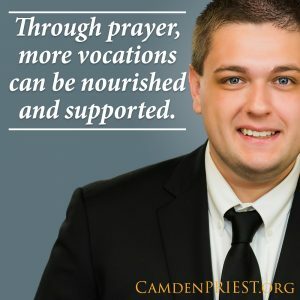 Through prayer, and events like iRace4Vocations, more vocations can be nourished and supported, and we can see an increase in shepherds for God’s people.